Having multiple jobs and an hour commute, I knew I was doomed to spend countless, fragmented hours piecing together my class schedule. RateMyProfessors.com and course catalogs were my best friends as I earned my education at my local community college. I have to say, I was doing fine – that is, until I once overestimated myself and had to withdraw from a community college class, losing money and weakening my GPA. But after attending Rowan’s transfer student orientation, the University presented me with a solution to my pitiful situation. Following a presentation and a campus tour, students separate to meet with faculty or staff academic advisors to register for courses for their first semester. That day, as I walked away from campus I left with a perfect class schedule and a satisfying sense of emotional relief. Since then, I meet with my academic advisor Lori Block every semester, sometimes even a couple of times a semester, to make sure I am on track and not missing out on anything Rowan has to offer. 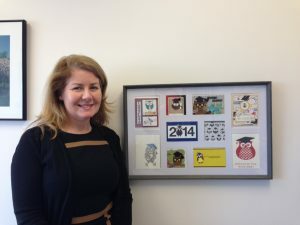 Vice President Rory McElwee, Ph.D. stands near owl art in her office in the Advising Center. Today Vice President for Enrollment and Student Success Rory McElwee, Ph.D., shares with us how students benefit from an improved advising model, leading others to that same sense of emotional relief that I first felt here. Natalia: When did Rowan decide to switch the advising model? 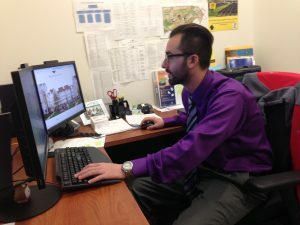 Dr. McElwee: In 2012 Rowan President Ali Houshmand, along with the Provost Dr. James A. Newell and Senior Vice President for Strategic Enrollment Management Dr. Jeff Hand, decided to implement a new system for academic advising. We have worked since then toward an ultimate goal of building, what we call, a dual advising model. Our first goal is to ensure that every undergraduate student is assigned to a professional advisor whose sole job is academic advising. The advisors will all have the same training, ongoing professional development and use the same protocols. They are a part of University Advising Services, which falls under me. Our second goal is to also connect every student with a faculty mentor in their field of study. 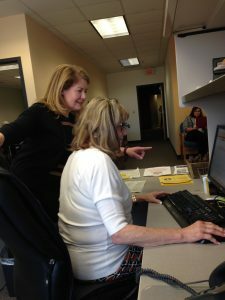 Vice President Rory McElwee, Ph.D. guides an administrative assistant in the University Advising Center. Natalia: You mentioned “a dual advising model,” what exactly does that mean? Dr. McElwee: The “dual” part of the model is making sure that in addition to assigning students to professional academic advisors we are also connecting students with faculty, so that students will also have access to faculty mentors in their major. Each major or College can determine the best way to approach this. Some of them might assign students to a particular faculty member, or direct them to a person they can talk to. Many faculty already advise student organizations. So it can take many different forms. But again, in the near future we want every single student to have an appointed professional advisor, in addition to a faculty mentor. Natalia: Before Rowan started to shift toward an improved advising process, how did advising at Rowan work? Dr. McElwee: Before we launched the advising redesign process, about a third of our students had access to professional advising and only in a few departments. So the University decided to hire professional advisors. Some of our staff were hired recently and they’re brand new, just getting started. And we are still hiring more people. Currently there are 46 professional advisors. About 80% of students will have access to professional advising this year. Academic advisor Rachel Budmen meets with a student. Natalia: Was the University supportive of the new system? Dr. McElwee: The University community, especially President Ali Houshmand, is very supportive of the new advising system and we cannot supply advisors fast enough. We can’t thank the president more because we’ve always known what we wanted to do with the students and now we are able to do this. So far we have hired a lot of people, but, as we expected, we are still in the process of reaching our goal. We are embedding our advisors into the academic departments they are serving, so they are next to the faculty, the students and the department chairperson. That way they feel like a part of the departments, as well as a part of University Advising Services. 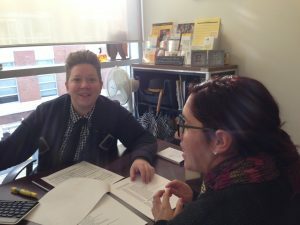 Natalia: What kind of help can a student get after meeting with a professional advisor? Dr. McElwee: The advisors help students to navigate the whole academic part of their experience here. Whereas faculty are experts in their specific discipline, like I used to be a psychology faculty member and I could help students in the psychology field, the professional advisors are experts in the College, in Rowan and in student development. So they help students to make most of their time here academically, by being in the right major, making sure that they understand what the degree program is and how they are progressing toward it. Tutoring, coaching or services in the Wellness Center are some of the many resources advisors will help students to connect with. They will also talk to students about the totality of their experience at Rowan. Is the student interested in becoming an RA? Is the student interested in participating in leadership at Rowan or in joining a student organization? We want students to understand all of the options they have at Rowan, so they can choose what’s best for them and become intentional about making degree progress. Natalia: How will a new model help students to graduate on time? Dr. McElwee: About halfway through each semester faculty members complete progress surveys in Rowan Success Network powered by Starfish. In Starfish, faculty can note student excellence or mark that a student is struggling with low test scores or things of that nature. Our advisors access Starfish records and talk with the students about any concerns the faculty have raised. We call it early intervention in helping students to connect with available resources and talk through any concerns, while they still have time to improve their grade that semester. 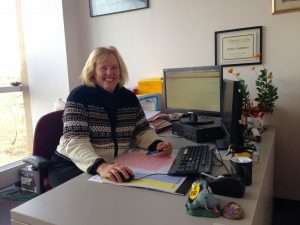 Academic advisor Esther Mummert works at her desk in the Advising Center. Our messaging about time to earn a degree is very important, as well. While we have posters “15 to finish” around the campus, we want students to realize that it is fine if not everybody fits in the same mold. However, we have to look at specific degree requirements and at the number of credits taken to accurately calculate the date of graduation, for the students to be satisfied with that plan. How often do you discuss your academic progress with a professional advisor or faculty member? Let us know in the comments below.